Some of that magical mojo people feel with the advent of the New Year tends to slip away as the early months pass by. It makes sense. Why wouldn’t excitement wane as the elation of holiday vacation time subsides and everyone settles back into “business as usual”? Do you experience a little dip in enthusiasm around this time of year? I admit that I do. And I’m betting your employees do, too. So how can you re-establish momentum? I’ve found that happy and less-stressed team members are more engaged and productive. And fortunately, with some creativity, you can help re-energize your team and elevate their performance. If it’s feasible for your business, consider giving your team members more control over their work environment. This could take various forms – perhaps the option of working from home one day a week or starting the workday earlier or later than your normal office hours. Flexibility helps improve work-life balance, and studies have shown that employees who feel they have a good balance work harder than those who don’t. Add a breath of fresh air to your workplace with some Google-esque elements. Consider supplying the office with some board games that your employees can use during lunch breaks or when they need to step away from the grind. Add beanbag chairs or hammocks in rooms where your team members do a lot of brainstorming. If you have room for storage, , a stowable ping-pong table could offer your team a way to burn off some stress and tackle their responsibilities with renewed fervor. Surprise your employees with a short getaway where they can strengthen their business relationships in a relaxed environment. This doesn’t have to be an expensive or time-extensive endeavor. It can be as simple as going bowling or holding a scavenger hunt. Just make sure it’s something everyone will be comfortable with and able to participate in. Nearly every day of every month has been dubbed a way to acknowledge some interesting and often off-the-wall special occasion. This presents many opportunities for you mix things up in the coming months. National Frozen Food Day (March 6) – Bring ice cream sandwiches, or set up a “make your own sundae” bar in the lunchroom. Make Up Your Own Holiday Day (March 26) – A week or more before this day, invite your employees to brainstorm ideas for a new holiday. Then, as a group, decide which one your office will celebrate on March 26. Draw a Picture of a Bird Day (April 8) – Bring art supplies to your office, and let your employees put their inner artists to work. Then, set up a makeshift gallery to display their masterpieces. Whether your team members have innate artistic abilities or not, this has the potential to be a lot of fun. In fact, you can expect that some of the less-than-accomplished artists in your group will enjoy it the most. Eat What You Want Day (May 11) – Give your employees the opportunity to indulge a little while at work. Encourage them to bring in their favorite foods, and set up a “guilty pleasure” buffet. Just take care that you consider food allergies when planning this occasion. Take Your Dog to Work Day (Friday after Father’s Day) – This could prove to be a real tail wagger, provided everyone in your office is in favor of it AND your employees’ have friendly, well-mannered and housebroken pups. 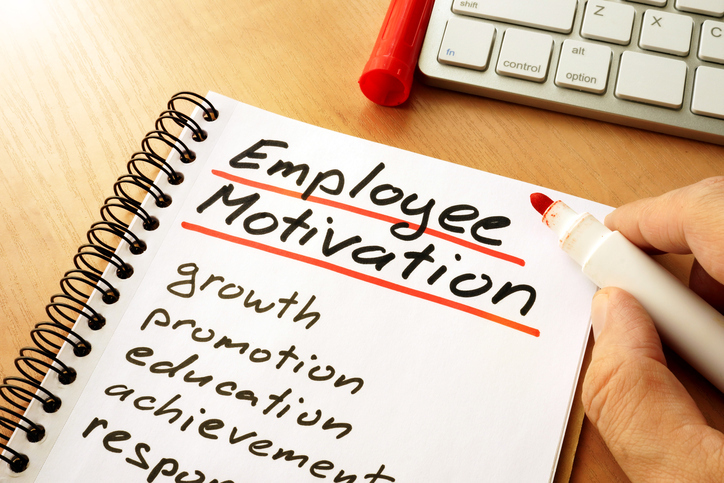 When in doubt of what might motivate your employees, ask for their input on the matter. It doesn’t get any easier than that. Keep an open mind as you collect ideas. While some might be impractical or cost-prohibitive at face value, there may be ways to adapt them so they will work. By asking your team members to weigh in on what will make their work environment more motivating, you’ll demonstrate that you value their thoughts and care about their needs. How Will You Reinforce Morale and Re-Engage Your Team? The tactics that will bring the best results for your company will depend on your company culture and your employees’ preferences. Always be on the lookout for ways you can add value, build loyalty and motivate everyone on your team to approach their work with energy and avid interest.